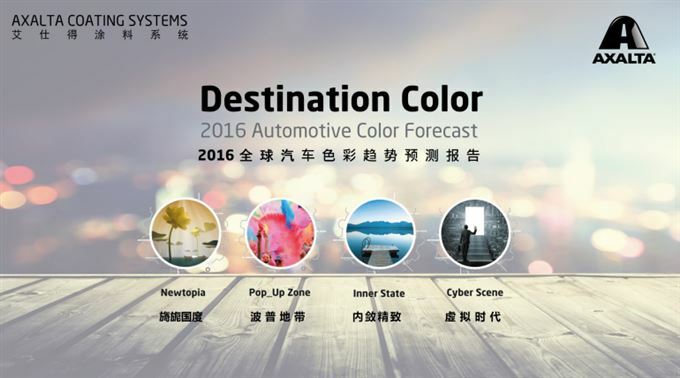 Axalta Coating Systems has launched Destination Color 2016, a portfolio of colour choices that it explains is inspired by changing consumer lifestyles and which is designed to enable car manufacturers to select colours that will fulfill their customers’ preferences for vehicles in China and around the world. The colour trends are grouped into four 'colour destinations' that reflect megatrends: Newtopia, Pop_up Zone, Inner State and Cyber Sis filled with dream-like colours such as peach, pink shades and muted purple with flake or tricoat pearl effects. The target vehicle segment is small and medium size cars. “A subset of millennial consumers purchasing vehicles would like these colors as they search for a new look to accentuate their personalities or make a fashion statement with their choice of vehicle color,” said Nancy Lockhart, Global Color Marketing Manager at Axalta who is in China for the Axalta Color Show to present Destination Color 2016 to OEM customers. Axalta, which celebrates its 150th anniversary in the coating industry this year, established the first-ever Colour Advisory Committee 90 years ago to craft colours specifically for cars. Since then, the company has remained committed to colour technology and innovation. Over the decades, Axalta has built a database of more than seven million colours which provides both original equipment manufacturers and collision repair technicians with one of the most extensive color databases in the world. China is an important focus for the company and it has invested in facilities such as its Global Colour Lab in Shanghai where colour experts work closely with automotive OEMs to create colours that meet local and regional demands while analyzing market trends for colour preferences.